Where: This 5K road race starts at the Yale Bowl and winds through surrounding neighborhoods and the scenic Edgewood Park. All proceeds from the race support the charity Shoe4Africa (www.shoe4africa.org), which works to use athletics on a community level to support widespread initiatives in education and health, with an�emphasis of HIV/AIDS awareness. 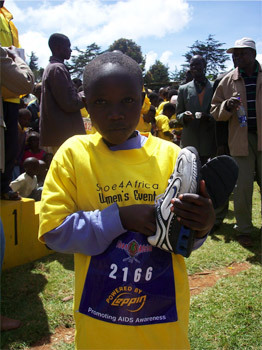 As part of these initiatives, Shoe4Africa�collects new and used athletic shoes and distributes them in Africa at the popular�Shoe4Africa community road races. The 5K (3.1mi) "fun run" is open to all ages and abilities.� Participants receive a free race t-shirt, entry into a raffle prize drawing, and�post-race refreshments! If you have new or lightly used athletic shoes that youd like to�donate to the cause, start looking for Run4Africa boxes around campus (e.g.�at the gym, outside residential dining halls, etc. ), and drop them off during the weeks leading up to the race, or at�the race itself! For more complete information, please go to www.yalebulldogs.com/ run4africa.html.� You can also go directly�to online registration: http://www.active.com/event_detail.cfm?event_id=1723003. �Discounts are available for youth and students.� Register now to guarantee t-shirt sizes and availability!